The City of Buena Park’s ten-mile area is home to over 78,000 residents. The original settlers where granted land by the king of Spain. In 1822 Mexico held authority of the area until California became a state in 1850. Originally an agricultural center, today Buena Park is mainly residential. 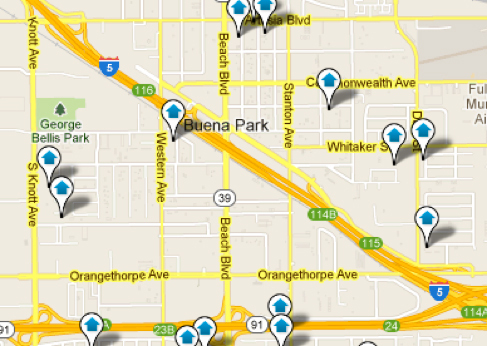 All Buena Park homes for sale that are currently on the market are right here on our website! The schools in Buena Park include seven different school districts. Although Buena Park High school is the only high school within the city limits, four other high schools service the area. For more information on the schools in the area please contact a North Orange County Real Estate agent for assistance. Buena Park is home to America’s first amusement park, founded in the 1920’s. Walter Knott began selling berries at a roadside stand on Highway 39. To make ends meet his wife, sold chicken dinners on their wedding china. Soon they added a volcano and more shops to entertain the visitors waiting for dinner. Walter Knott continued to expand and soon Knott’s Berry Farm Park blossomed with gold mines, ghost town, stagecoach, and rides. Today the park has nine world-class roller coasters as well as Camp Snoopy for younger children and, yes, visitors can still enjoy Mrs. Knott’s famous chicken dinner. Buena Park’s E-Zone district on Beach Boulevard has many tourist attractions. Besides Knott’s Berry Farm the area is home to Soak City, Medieval Times, and Pirate Cove dinner theater. Besides large amusement parks, the city is home to eleven residential parks that run throughout Buena Park real estate. The parks include a dog park for our four legged friends and a skate park for thrill seekers. The city offers extensive recreational programs including a summer aquatics program. Recreational classes are available for children and adults. Some of the classes include dance, tumbling, arts and crafts, adult softball league, youth sports, and golf lesions. Buena Park homes for sale are available from the mid $200,000 to $900,000. There are many different neighborhoods, styles and sizes of homes to choose from to fit your family’s needs. North Orange County Real Estate agents are trained realtors and can assist you with purchasing a new Placentia home or helping you list your current home. Our agents know Buena Park homes for sale and can answer all your Orange County real estate questions. Feel free to browse the Buena Park homes listings on the website and call if you have any questions or would like to tour a home. Major fixer, TLC, Investor Special, Cash or Hard Money Only, will not be accepting retail offers. Quick Close. Bring your toolbox. PRICE REDUCED!! !